It’s time for our Annual General Meeting with a little bit of a twist…. Queer youth in Hamilton can come along and get crafty, make a masquerade mask for the Youth Pride Ball later in the week, help us create pride decorations or just to hang out and meet some new friends. This activity will run before and during the AGM, that way if youth want to attend the AGM and see how WaQuY works behind the scenes, then they can – or they can continue on with their Crafternoon! As usual our AGM will run from 6pm – 7pm and is open to the community – this includes other organisations, family, friends, or anyone that wants to come along and find out a bit more about WaQuY and how you can get involved and support us! 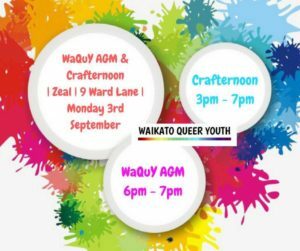 AGM & Crafternoon | Monday 3rd September | 3pm – 7pm | Zeal | 9 Ward Lane | Free Entry | Hosted by WaQuY | See you there!